I am adding 'make a granny square blanket' to my list of goals this year. But I suppose I should add 'learn how to crochet a granny square' first. I found instructions here. Crossing my fingers I'll be able to figure it out, wish me luck! Anyone care to join me? 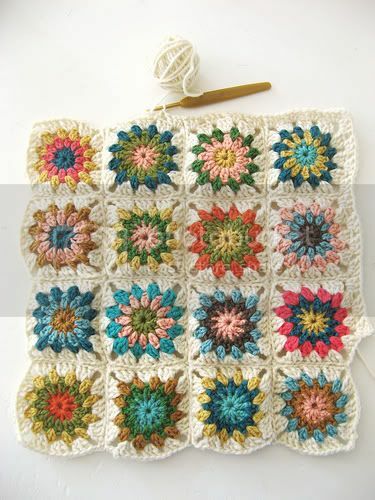 Do you already know how to crochet a granny square? when i was in chili i learned to crochet squares and then i connected them all into a blanket. i swore i'd never do it again. south american yarn is stinky. plus, once i put them together they all puckered. 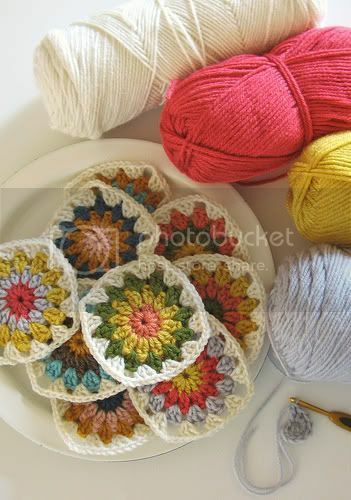 but those granny squares look very tempting to try. i just watched the movie "snow day" and a girl had a scarf made out of those. it was very cute. hint. you could make me one for practice. fun - I love crocheting! You'll have to post your project. I'm doing two more of my crocheted blankets.